With its many superior qualities, photonic sensing technology is increasingly used in early-detection and early-warning systems for biological hazards, structural flaws, and security threats. Photonic Sensing provides for the first time a comprehensive review of this exciting and rapidly evolving field, focusing on the development of cutting-edge applications in diverse areas of safety and security, from biodetection to biometrics. 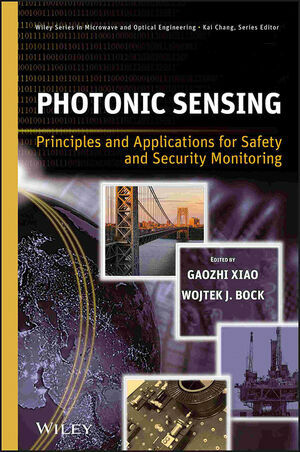 An invaluable, multidisciplinary resource for researchers and professionals in photonic sensing, as well as safety and security monitoring, this book will help readers jump-start their own research and development in areas of physics, chemistry, biology, medicine, mechanics, electronics, and defense. GAOZHI (GEORGE) XIAO is Senior Research Officer at the Institute for Microstructural Science at Canada's National Research Council. He is an associate editor for IEEE Transactions on Instrumentation and Measurement and Adjunct Professor in the Department of Electronics at Carleton University in Ottawa, Canada. WOJTEK J. BOCK is Chair of Canada Research on Photonics. His areas of research include fiber optic sensors, metrology, and calibration parameters of non-electric optoelectronics.